HELLO THERE. After obsessively searching through every single Zara store that crossed my path these past weeks, I finally managed to hunt down these amazing heels. Love the mix of patterns + vibrant colors! HEELS Zara. CANDLE Jonathan Adler (here). 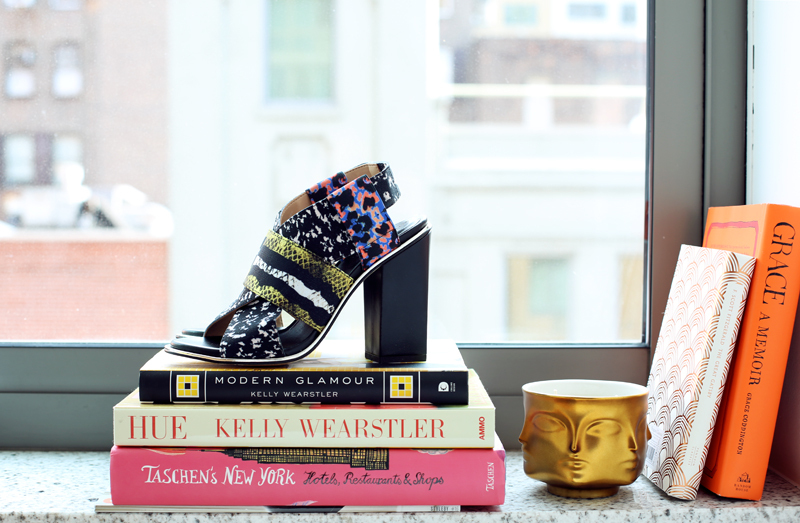 BOOKS Kelly Wearstler ‘Modern Glamour‘. Kelly Wearstler ‘Hue‘. Taschen’s ‘New York‘. F. Scott Fitzgerald ‘The great Gatsby‘. Grace Coddington ‘Grace, a memoir‘. This entry was posted in Details and tagged grace coddington, jonathan adler, kelly wearstler, the great gatsby by Carolina Engman. Bookmark the permalink. Love these heels ♥♥ Great shoot! Hi, I’m totally in love with these shoes. Super cool heels! Perfect fo this season, they look comy too! I noticed them, gorgeous heels, very kenzo! Ahhhh I absolutely love these shoes! I have been trying to find them but they’re sold out everywhere. Probably safer to get them online…! OMG, that shoe is truly a piece of art. love it! Oh my god, those are amazing! Oh my Gosh!! I want that heels too! These shoes are amazing! So gorgeous. I’ve had my eye on those for ages, such a cool mix of prints and colours. They do look like a pair of Kirkwoods! Definitely worth hunting them down! That shoes looks perfect. Have a nice day. Great! they are colorful and fun to wear too for sure! These are very pretty, love the shape of the heel and the colors are amazing! Just found them online, the only thing that concerns me is the height of the heel. I’m a bad, bad heel walker. But I can always order them right ;) ? These shoes are really amazing! Congrats you are a great fashion blogger! Love them and the candle too! In my post today…..Can you help me to choose my new leather biker jacket from one of the celebrities favourite brand?. Have a look!!! amázing heels! And great books! I got the same sandals, super in love with them :) Enjoy! They were most definitely worth the hunt :) Zara are killing it lately with footwear! Oh my gosh they are beautiful, I can’t wait to see them on! I wouldn’t have guessed these were Zara :) Very pretty ! These are on my wishlist as well but so hard to find! Ooh, those heels are beautiful. Stunning! What a great find! These shoes are just made for you. Love the pattern! I can’t wait to see you wearing it. These are stunning – I love them! why hello! those sandals are beautiful. zara has such nice sandals and loafers lately. Never thought they were Zara when I saw the pic! Great! I LOVE how you decorate your spaces, please please pretty please show us more of your decor skills!!! Zara is seriously best bang for your buck, not to mention some of their pieces are definitely just as covetable as high-end designers’. Not a huge fan of those heels. Maybe they look better on feet. That shoe is gorge and that photo is perfection! Amazing shoes, really suit your style. zara is awesome! i could buy everything i own from that store!!! Wow this heels r amazing. Hope u already feel home here in ny. Gorgeous heels. I love the mixed prints. Ahhh i’m soooo much in LOVE with ZARA! Great fashion inspiration, love that pattern! these heels are must have for this season!! Wow, I’d go to great lengths for these shoes too. WOW! Those heels are simply amazing! I adore the combination of those different patterns and colours! Perfect shoes for summer <3! Those heels are super cool! Love this shoe, its so perfect!!! Wowzers! These are a fabulous find! Worth the time hunting them down! Can’t wait to see how you style them in a future post!! I love those heels they look expensive but actually they are not! Estupendos zapatos para tener los pies frescos en verano pero con un gran estilo. Love those Zara heels, they’re not too high either which is nice! hi Carolina, beautiful pictures, like them! Those heels are pretty bold and unique but i like them ! i have read modern glamour! such good and useful book! Those heels are stunning! Love the print! I can’t wait to see the way you pair them, they are such a statement, I like it! Wow these are stunning! Definitely worth hunting for! Stuning & Wild !!! So much love from France, Carolina. Love the heels and great shot!